One of the aspects of storytelling that makes teams popular is the fun you can have with them once the characters are established and the team is really working as a team. If you’ve written the characters as strong, contrasting individuals, putting them together in different pairings in different situations can create some great expectations (see Ray and Mick in a Russian prison, for example) and surprising reversals. And once the team has finally bonded, sending them out against a powerful adversary is more than fun, it’s like watching a Rube Goldberg machine in action, the individual moves of the team as exciting as the final outcome of them working together. Yep, that’s a Legends plot. The key, though, is that they work together. The plot can be convoluted, but even the fun parts have to move the story. Another problem: most often in team stories the team bonds by the midpoint, which throws the “let’s have fun” into the third act. The third act has to burn off the subplot and character growth so that the crisis/third turning point leaves the team beaten and broken (in spirit if not as a team) before they come back to defeat or be destroyed by the antagonist. In other words, you’re supposed to pick up speed in the third act, not start dicking around, so all of that fun stuff has to be in direct service to the plot. In the next two Season One episodes, the team has bonded (although still not sure about Mick), the characters are developed and bouncing off each other, and they’re up against one-off villains they can defeat by the end of the hour. All they have to do is stop dicking around and move toward that goal of saving the future . . . The team is on the run from the Hunters, sent by the Time Masters to kill them, so Rip finds them a place in the timeline where they can hide until he can figure out what to do (Worst Team Leader Ever): The American West. The show gets full points from me for sending the eight of them into town in slow motion like a badass gang from the old movies, but I’m not sure how “let’s hide” moves the plot. Rip tells them not to attract attention to themselves but there’s a bar and . . . The writers have a good time in the bar. Mick challenges Sara to a drinking contest and she leaves him passed out on the bar. Stein plays poker, wins, and almost gets shot by the loser except that Snart shoots first (Stein: “You shot him!” Snart: “You’re welcome.”) It’s all fun and games until it turns out that the guy Snart shot is part of the gang terrorizing the town, and now they’ve got to defeat that gang and save the town. There’s a whole thing with Jonah Hex explaining that Rip left a town to be destroyed by a similar gang, which means of course that Rip must now face down the leader of the gang in a high noon shoot out to do penance. Or something. And where’s Kendra? Oh, meeting with her former self from this time period and finding out that her love with Ray is doomed. (This stuff is a tragic waste of Anna Deavere Smith.) Meanwhile Stein saves the life of a small boy named H. G. Wells. What was the plot again? Right the Hunters are chasing them so they have to lie low so they can defeat Vandal Savage. For how long are they hiding? What’s the plan to defeat the Hunters? How does Savage figure into this? What about the future? Here’s the key to having a good time with a team: You still have to tell a story. Every scene still has to move that story. 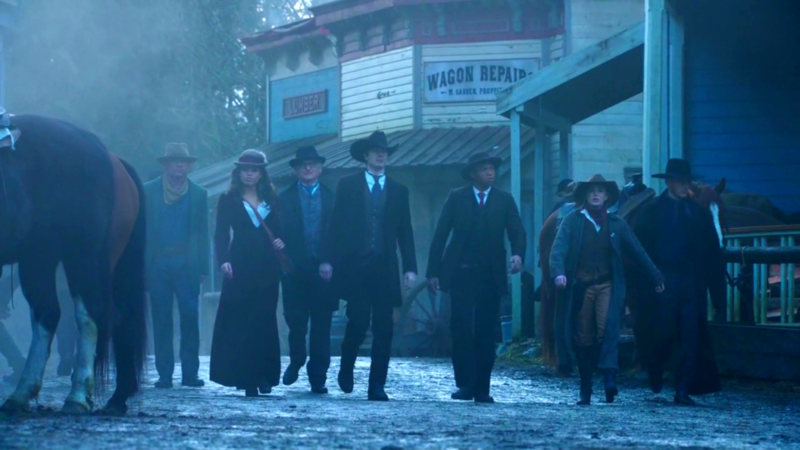 As much fun as this episode is, most of it is dumb (Ray announcing his name is John Wayne, Stein suggesting to the Wells boy that he call himself “H.G.,” Kendra’s living flashback) and the penutimate conflict of Rip shooting the gang leader and saving the town gets overrun as an anti-climax when the Hunters show up (because the team has made so much noise in the timeline) and there’s a fight in the street that could have been played to Yakkity Sax. So the townspeople see a flying man on fire and another man in a robot suit, also flying, and a woman turn into a hawk goddess because THAT’s not going to screw with the timeline, and you realize that the writers don’t give a damn about the aberrations in the timeline until they need them for the plot. Even Snart, who also doesn’t give a damn about history, asks if Rip doesn’t have one of those flashing thingies that wipes people memories, and Rip handwaves it away by saying people will figure out explanations in their own minds because the truth is so unbelievable. Oh-kay. Our Gang defeating the Hunters has made the Time Masters up their game. They’ve sent their ultimate assassin, the Pilgrim, after the team this time, and she’s not going to bother with killing them in the now; she’s going back to the past to off them as children. Whatever you think of her plan, it’s a great way to get back story into the now of the story while getting to see teenage Mick make a pass at teenage Sara and get slapped for his troubles. But the fun in this is undercut first by the Pilgrim’s inexplicable choices. She’s goes after Mick and Sara as teenagers (why?) after Snart and Stein and Jax as newborns (much smarter and much easier to kill), and Ray as an adult. You want this to be fun, get them all as teenagers and put them in storage room on the ship together. 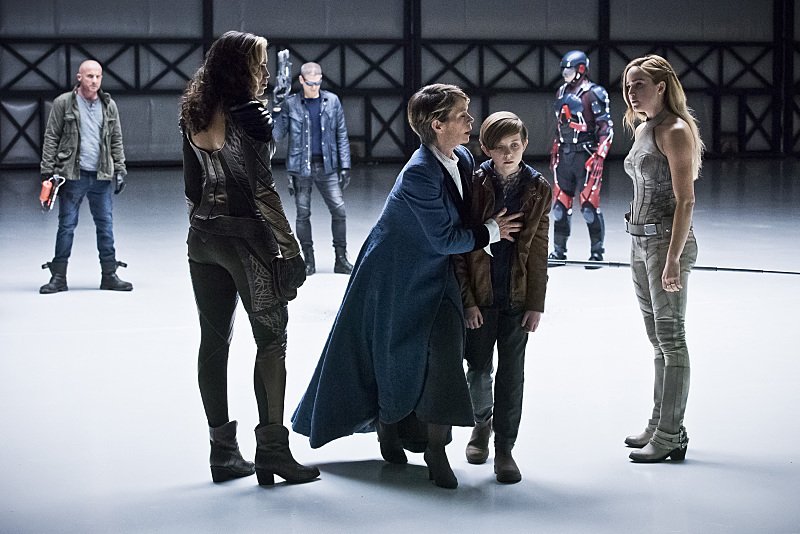 You want this to be smart, collect all the babies (Sara and Kendra go after baby Snart–“Look for the one with horns” Sara tells Kendra–but then they’re both overwhelmed by how cute Snart is as a baby in spite of his dastardly future). So the Pilgrim’s methods are .. . inefficient, plus why is she so slow that when they follow her, they get there first? And so inept that they can always defeat her? She’s the greatest the Time Masters have to offer? Time Masters: Worst Cult Leaders Ever, which helps explain Rip. Never mind, we’re going to the orphanage/foster home where the Time Masters stash children so they can be trained and grow up to be Time Masters. There’s a lot of fun stuff with Rip’s foster mother running everybody with an iron hand, Mick has a heart-to-heart with his teenage self, in hopes that he won’t be the idiot that Mick in this timeline was (and there’s some evidence that works), and then the Pilgrim kidnaps the team’s loved ones–Stein’s wife, Snart’s sister, Jax’s dad, Sara’s dad–and threatens to kill them if the team doesn’t surrender to them. Rip makes a deal: he’ll turn over his younger self to her to kill which will wipe him out of the timeline and which will mean that the rest of the team never becomes a team because he won’t be around to recruit them, and their loved ones will never have been kidnapped . . . or something. This is actually a good plan. Why didn’t the Pilgrim think of that first if she’s their top executioner? She takes the deal, they all meet in an abandoned airline hanger, Rip sends his cheeky, cockney grade school self to meet her, Young Rip does an innocent, eye-batting “Did I do something wrong, miss?” and then stabs her, giving the others a chance to all attack her at once and leave her a grease spot on the floor of the hanger. This show would have been 100% better if Young Rip had been in charge the whole time. And probably 100% shorter because he’s actually effective. The foster home mother raised a real badass and then the Time Masters made him into a wimp and kept him instead of his smart, effective wife. This show is full of idiots. Back on the ship, the Legends say good-bye to their loved ones and younger selves and return them to their places in the timeline after giving them amnesia pills (which would have been a great move back in the old West since the town wasn’t that damn large) and . . . Remember the main plot?. Defeating Savage? I understand that they have to save their younger selves, I understand the Time Masters are an antagonist in Rip’s subplot, but they’ve been insisting all season that Savage is the big story, the main antagonist. Now as the plot is supposed to speed up toward the crisis point, they’re fighting the Time Masters instead. Yeah, there’s a big reveal coming up on that one shortly which makes me want to nuke the writers’ room because they probably think that explains everything, but we’re watching this for the first time, and as much fun as these episodes are, and they really are fun for the most part, they’re not going anywhere. I completely understand dodging the Savage plot, it’s awful, but that’s your plot, people. FIX IT, don’t duck it or your readers/viewers will get confused and annoyed. Rip decides that they’ll just have to take Savage out of the picture right before he kills Rip’s family. YA’THINK? The team travels to London, 2166, where they kidnap Savage’s daughter because she has a bracelet from Egypt that will enable them to kill Savage despite his immortality (you’d think he’d put that somewhere safe, like the center of the earth). They show her that her father is evil and what he will do, and she turns on a dime, which I found suspicious, but then it’s Snart showing her the facts, so I’ll allow it. She turns over the bracelet, they melt it over Carter’s mace (don’t ask) and they attack Savage, who is now attended by a brainwashed Carter. Kendra has him down and is about to pound him into non-immortal nuggets with her magic mace when Savage tells her that if she kills him, Carter will remain a mindless drone. • Carter is immortal, so if Kendra takes him out, too, they’ll reincarnate again. • The future of the entire world is at stake. Kendra refuses to kill Savage so she can possibly save Carter from being a mindless drone in this timeline because she loves him SO MUCH so the fact that she’s been shacking up with Ray for over two years is . . . They imprison Savage on board the Waverider in spite of Snart pointing out that this is a DUMB IDEA. Snart, Sara, or Mick would have killed Savage without hesitation, but all the big decisions fall to Kendra, who used to be a barista. The big robot fight was kinda fun, but the idiocy in the plot shows the strain of writers who know they have three more episodes to go, and they can’t kill the bad guy until the end. • Somehow make each one of the episodes move the plot closer to capturing Savage by having him involved with the Hunters and the Pilgrim. • Make the Hunters and the Pilgrim efficient (also idiots: the Time Masters). • Plot this so that the Legends and Savage do real damage to each other, so that they’re both more determined to win. I think the actor playing Savage was Not Good, but Savage never changed because of anything that happened in the plot; he was always the same cartoon; nothing the Legends did ever bothered him because he knew he’d come back again. It’s just a terrible plot in general, and it really creaks in this third act. This act has to push the conflict to the crisis point when all is lost, but the legends are exactly where they were at the beginning, the only people who have really changed are Snart and Mick. Sara’s still a badass, Stein and Jax are still sniping, Ray is still insecure (and having Kendra refuse to save the future to save Big Block of Wood is not helping), and Rip is still the Worst Team Leader Ever. If this was the Mick and Snart show, that would be okay, you don’t have to arc your supporting characters (although it’s nice), but since this is Rip’s story and he hasn’t learned a damned thing, there’s no sense of rising tension, no sense of things coming to a breaking point, it’s your basic string of pearls plot, but the pearls are plastic and they’re pop beads. Which means that the only real way to fix this mess is to start over from the beginning, plan a strong plot arc with escalating conflict, build to the crisis/breaking point, and then stage the obligatory scene between the protag and the antag . . .
Short answer: It’s too late to fix this mess. Get out and start a new season/story. Pictured above: The Legends crew searching desperately for a plot line. As I understood it, the Pilgrim wasn’t planning to go after them as newborns, which is why Sara, Mick, and Ray were all older. Rip said something about choosing a time that minimizes damage to the timeline when she works. Then since they couldn’t find her, they decided to kidnap the rest of the team as newborns to take away her options, and she reacted to that. It would have been nice if they’d explained how she chooses her one shot at killing younger versions of people, but apparently there was a method. I wanted to strangle Kendra when she didn’t kill Savage. YOU HAD ONE JOB. The only reason she’s even on the ship, and she can’t get that done. It doesn’t help that I was actually happy when Carter died in the pilot. I’m sure relief isn’t what they were going for with that death. Having his reappearance be the reason Kendra chokes just made me dislike him even more. I know. Carter showed up and I thought, “Kill it with fire.” I don’t think I’ve ever been as annoyed with a character as I was when she wimped out killing the guy who was going to murder millions. I think we were supposed to feel for the terrible choice she had to make, but really, just kill Savage and catch Carter on the flip side. As for the handwaving about minimizing damage to the timeline, that would be now. Taking Sara out as a teenager wipes out the yacht crash, the insane scientist, the League of Assassins stint, the Black Canary, the Lazarus Pit dip . . . Taking Mick out as a teenager means he never meets Snart. That’s a lot of damage. Blow the ship up, killing everybody now, minimal damage. I will stop ranting now. They don’t do much better with time travel on The Flash. Somewhat better, but I think that’s just because they don’t talk about it all the time. As soon as Zoom started talking about time line remnants, it all stopped making sense, and then they went and did Flashpoint and made it even worse. Moffat did his fair share of handwaving once he took over Who (I watched the season 5 finale again, and that whole bit where the Doctor gives Rory the sonic so he can get him out of the box STILL DOES NOT MAKE SENSE; just leave the stupid screwdriver outside the box where Rory can find it), but it was never as out of control as it is on the DC shows. I think with the Doctor you just have to glory in the Doctor. That opening bit in the Wedding of River Song (I think) where dirigibles are flying over London with pterodactyls because River won’t shoot the Doctor and restart time . . . that makes no sense but it’s so beautiful and so batshit that I love it anyway. The problem with time travel in the Arrowverse is that they want it both ways; they want it to be scientific and then when the theory falls apart they go back to timey-wimey, and so neither one works. The Doctor changes the past all the time and never blinks an eye about time anomalies. The Arrowverse either has to do the same thing or, since it’s full of scientists and physicists, decide on a set a world rules for time travel and stick to them, instead of just coming up with a new rule to plaster over whatever wound they’ve opened in the story. Right now Stein is making Jax promise not to tell the rest of the crew he has an adult daughter because of what he told his former self in the past because he doesn’t want them to go back fix the anomaly and wipe her out of existence. But since she invented the nanotech that allowed them to stop the alien invasion, they’d have to be idiots to do that. 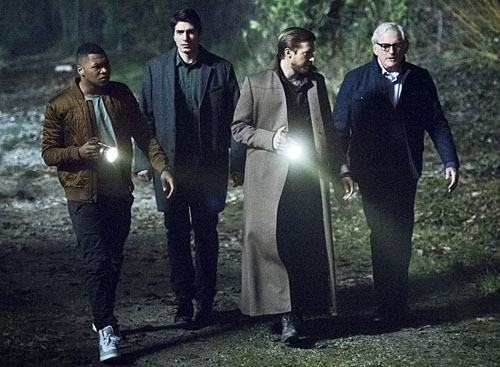 And next week, as I understand it, they’re going to run into Snart in the past before he joined the Waverider Team and died. His interactions with Sara and especially with Mick are going to screw with time, I don’t think there’s any way they can stop that. So the DC CW showrunners have to, at some point, sit down and make a time travel bible to give to the writers explaining what can be done through time travel, what they can’t do, and what they can do but shouldn’t. Either that or go the Doctor’s route and just stay blissfully uncaring about screwing up history. I think the bit in “The Big Bang” bothers me so much because it seems like one of those things Moffat did just for the sake of being clever when there were non-timey-wimey options available that wouldn’t give me a headache. The Doctor doesn’t worry about anomalies, but they do have him say more than once that for the most part they correct themselves. And then there are the “fixed” points in time that he knows not to mess with. Except for that one time on Mars. They gave themselves a reason not to worry about the changes, so it works. Thinking about Doctor Who is really helping me clarify my issues with Flash/Legends time travel. When Barry accidentally goes back in time a few hours or a day, it works. But when they started making it a feature, they really needed to make those rules. You’d think that would have been the first thing they did on Legends, but if they haven’t done it by now, I doubt there are plans to do it at all. The conceit now is that the Legends are there to fix time anomalies. That helps somewhat, I think, but they still need time travel rules for that universe, especially since all the shows have it now that the big crossover put most of Arrow in the time ship. And I just realized that as wonderfully bizarre as some of the stuff in “Wedding of River Song” is (that really is a fun episode), the core premise is time going insane because River tried to alter a fixed point in time. So all the crazy makes sense in the context of the rules the show established. Some things can’t be changed without consequence. Of course the Doctor still found a way to cheat that a little, but she did have to shoot him. I thought that was interesting. It’s like Time is an observer and as long as she shot a Doctor-shaped thing in a spacesuit, Time was fine. Although he did lay low after that so as not to make too many waves. > just kill Savage and catch Carter on the flip side. If I’m guaranteed rebirth with my One True Love, suicide is like health insurance only better. Well, except I probably don’t want to spend half my total conscious time as an adolescent. Still. Especially if you can save your friends, your friend’s family, AND THE ENTIRE FREAKING WORLD. Plus she only has Savage’s word for it that Carter will remain mindless; maybe once Savage is dead, Carter will be just fine. A sudden thought strikes me — if a character is being reborn all through time and space, and one has the ability to travel through all time and space . . . that means to a certain extent, one is a fractured personality on the one hand. Bits of one’s personality is scattered through time. No wonder they are thin characters! Also, why doesn’t Kendra just choose the “Carter” that she liked best, go to that timeline, ditch (or negotiate to be part of a harem) with her reincarnated (preincarnated) self, and live happily ever after? In fact, why don’t they just gather all of the “Kendras” and all of the “Carters” and take out all of the Savages one by one? It’d be like 200 to one odds, right? I know why. It’s Doylistic: being smart and powerful would mean a very short story, at least with these writers. All Watsonian reasons probably stem from that. That’s why they set up random rules for whatever episode they were in. If something happens too long ago, the timeline hardens, unless it doesn’t. It was a mess. It’s gotta be terribly attractive to series writers (books or TV) to not fully plot the damn thing out. How long is a first act going to be? If they are lucky and have a 10 year series on their hands (optimism is lovely! ), then the first season is basically the end of the overture — cue the lights, curtain goes up on season two. If they don’t get ten seasons, though — if they only get the one — then everything is bad. Three acts, they are done, and haven’t accomplished much at all except kill the monsters of the week. I love BBC shows because they seem to be written specifically with an endpoint in mind. “We’ve got six hours to wrap this up.” And they seem to subscribe to a philosophy of plentitude — if the show is meant to have a second series, the next Big Bad will show up. So much science fiction seems to suffer from the False Hope of Never Ending Series. The Monsters of the Week aren’t big enough to keep one’s interest through three or four books, and the author can’t kill the Big Bad because there isn’t a Bigger Bad waiting in the wings. Killing the Big Bad is killing the kids’ college tuitions and the retirement fund. There are a few writers who do write in definite arcs. Lois McMaster Bujold does stand-alones in a life, and there isn’t just one Big Bad, but an assortment (like real life, matched to age and experience). Elizabeth Peters, if I remember right, wrote a lot of arcs in trilogies. She also relied upon Life (fictional version) to throw up new challenges sufficient to the day. The thing I notice about super-hero franchises is that the villains are often as important as the heroes. The end of one or the other (unlike real life) means the death of the story. There are no new heroes or villains popping up. Super-long-form fiction has a lot of good points. The characters can almost come to feel like friends you invite into your home on a regular basis. I tend to like super-long-form best when it’s segmented, rather than when it tries to ride some sort of gravy train into the sunset. Really good series like Leverage and Buffy have season long arcs that end; each season is a novel in itself. But really good showrunners plan for multiple seasons, knowing each one could be the last. The Person of Interest people had plans for another season if they’d gotten one, but they also had a series end in mind so when they got word it was the last season, they gave it a terrific finale. The key to doing a series–book, movie, TV, is to have a plot for each book/movie/season and a flexible plan for the long run. One of my friends asked me why I don’t watch Legends of Tomorrow. I said that it is because I can’t wrap my brain around time travel and timelines. It seems like the writers can’t either. Their explanations are pretty much “Because” and then a lot of jazz hands. I’ve been making my way through Teen Wolf, and an interesting side effect of it not being a team show (at least, for the first 3 seasons) meant that no one’s motivations were taken for granted. All players had to be given incentive to get involved, much less side with the protagonist. First, this meant that most all teams were only of convenience, which allowed for lots of interesting tensions and power shifts for drama, but more importantly, it meant that plotting fundamentally had to directly cause/involve character emotional investment. Nikita did the same. As a spy drama, with certain alliances never certain, plot was directly connected to character motivation and responsible for changes in character motivations at all times. So plot always mattered, and character always mattered. As you pointed out, none of the other DCTV shows started with teams, so they built them with plausible motivations and relationships. Legends had a team first, and didn’t do the full legwork on the reverse-plotting to get to that point. It looks like I’ve had a couple of comments on this post get eaten. Are they in spam? None of them had urls or anything. I went into the spam folder for you–my god, it’s vile in there–and I could only find one. There were almost 3000 spam posts, though, so I might have missed one. I approved that one, so it’s posted now. I have NO idea why it ended up in there; there’s nothing in there to trigger that. Akismet must have burped. Do the writers have to commit to the canon in the comics they’re pulling these series from? Is there a DC comic about this? I haven’t followed comics in over 12 years and I leaned more indie than DC/Marvel comic books. I read somewhere that is a more-or-less master writer group handling the Marvel movies and TV shows. That basically, if the movies have a plan to use Villian Q, that the TV shows have to work around that. Or another viewpoint, the TV writers are getting the scraps after the movies writers have finished. But Marvel started with a master plan. I guess my take from this is that DC Comics doesn’t have the same type of thing going.